Cape May Monarch Monitoring Project: A few more monarchs today make us eager for tomorrow. A few more monarchs today make us eager for tomorrow. It seemed like a few more monarchs were around Cape May Point on Saturday, and we discovered the first small roosts of the season. A modest number of monarchs gathered both this morning and this evening in a vacant lot along Stites Ave. in Cape May Point. This evening I estimated 25 to 30 monarchs here. Rain tonight is signaling the arrival of a cold front, with moderate northwest winds predicted for Sunday. 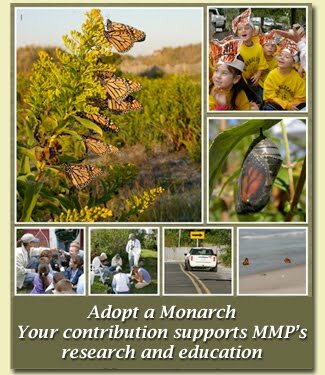 Conditions look perfect for bringing more monarchs into Cape May over the next few days, so we are hopeful, but we never know for sure. We'll be sure to post one or more updates tomorrow as we see just what unfolds. If you come to Cape May on Sunday, be sure to come to Cape May State Park at 2 pm for the season's third monarch talk and tagging demonstration, held at the East Picnic Pavilion (next to the big hawk watch platform). We usually run somewhere between 30 and 45 minutes, and there's no charge for this program. Get there early if you want a seat, we had 90 people there on Saturday! And if you're interested in monarchs AND other migrants, there's a good chance that Sunday's northwest winds will also bring other southbound creatures into our airspace. from 310 Stites Ave., a lot filled with ivy-covered trees. and keep your voices low. Also please don't park right next to the roost. with Merlins (above) and other falcons likely to be plentiful. Stilt Sandpipers were seen at the State Park today. to Cape May, such as this Black Saddlebags.